This is one of the most important moment in your life. Be extravagant. Sound of string quartet creates unique atmosphere. BSQ starts playing on gathering guests, about 15 minutes before the ceremony. There are some light classic pieces, tangos, film music themes and standarts. Just after swearing BSQ is playing solemn signal, excerpt from famous Alleluja by F. Haendel. BSQ offer Wedding March by F. Mendelssohn on ending and about 15 minutes background playing while wishes. We are delighted to play J. S. Bach – Air or G. J. Pachelbel – Canon on entry, then J. S. Bach/Ch. Gounod Ave Maria and at the end F. Schubert – Ave Maria or F. Mendelssohn Wedding March or R. Wagner. In addition we offer 15 minutes background music while giving young couple wishes. 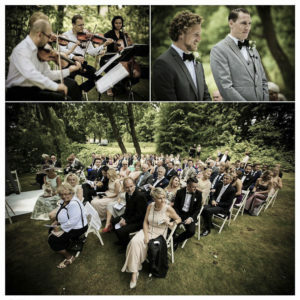 It is very interesting idea to invite string quartet to grace wedding dinner. Chamber playing on background brings up the ceremony’s rank and gives unique atmosphere. If you prefer BSQ offer to play a little concert just in the middle of the ceremony. BSQ’s first violinist becomes master of ceremony then. There are some funny stories about music and compositions between pieces and great amusement for guests. We will prepare for you an offer.